Second block for mother in law's comfortghan. None of these have ends woven in, or edged, just the raw finished blocks. They are all approximately 6 inches by 6 inches. 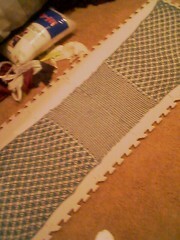 I am making plain squares to go between the bullions. Each square will be different, because I just can’t choose one of the blocks to work with! This is a nice bulky yarn and I’m using a K hook. Another block for mother in law's afghan. One of the blocks for my mother in law's comfort-ghan. I love doing bullions. I honestly don’t do them often enough in my projects, since I really do love making them. When I was deciding what kind of afghan to make for my mother in law, I happened upon Bonnie Pierce’s book, Twenty Four Blocks on a Roll, in my office. Besides being a dear friend, Bonnie is an exceptionally gifted, talented and generous person, still I didn’t buy the book because of all of that; I bought the book because it’s full of very beautiful squares. Never mind that afghans are the one project I make the least, I had to have this gorgeous collection of squares that just defy the “same ol’ same ol’ reputation of crochet. I never follow a pattern to the letter, though I am following her stitch counts. I think freeformer that Bonnie is, she’d be dissappointed if I actually used the color schemes as prescribed in the book. Aren’t these just beautiful? To see the original blocks go to her website http://www.elegantcrochet.com. Apple Blossom Stole Set’s Our Picot Free! 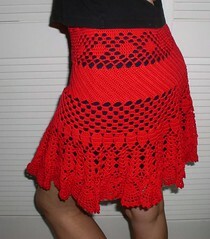 MoonCobress I adore this piece, I would so wear this piece, you have set my imagination and my picot free! Congratulations, you are duly awarded the Set My Picot Free award for stunning crochet! It’s time to pony up! Candi Jensen, Executive Producer of Knit and Crochet Today asked me if the CLF would help her generate awareness about the need for funds to produce Season 3 of the show! (To air on PBS starting Jan. ’10). Before I tell you all that a $5 donation could actually help save her show, I want you to know a little bit behind the production of the highest rated tv show of it’s kind! Candi is a one woman operation. She fell into being the Executive Producer of the show, had to learn how and what to do as a producer and owner of a production company. She’s a designer by trade, and has many patterns, books and articles floating out there. But imagine being thrown into that awesome path, having to learn on the fly and THEN losing the sponsor and having to find the money to keep the EMMY NOMINATED and HIGHEST RATED TV Show on the air! WOW! Daunting! I so resonate with Candi, and over the past few months have had the absolute pleasure of helping her with ideas for fundraising, and gotten to know that she really is as nice as she looks in her pictures in the magazines! (I’ve admired her and her talent for YEARS…yes, I have stars in my eyes)…When I found out she was a one woman operation I had to help, even if she named her show incorrectly. I mean we all know it SHOULD say Crochet and Knit Today, but really there’s trademarks and copywriting in the way now, so I’ll stop bugging her about it. Please help the show out! There is more information on the website listed above. I think we often imagine tv shows being millions of dollars of budgets. I happen to know that this show doesn’t have that kind of budget and if we can help raise about $50,000 in small donations then YEAH we can show the world that we LOVE this kind of programming. It’s worth it to me, and I hope it’s worth it to you! Thank you for your support and a minor celebration! Hey there Minions and Ring Leaders! Thank you to all of you who have purchased the CLF First Ever Book, be it on Amazon.com, or through our Website, or even in the .pdf version, your support has helped the CLF hit a new milestone. It was time to renew our website domain, and hosting service. Which runs just over $100.00 a year for what I am using (not counting the blog), and this is the first year that I did NOT have to dip into the household budget to pay for it! YAY! It was so nice to just be able to pay for the website from my little paypal account. This year I may not be totally in the red, I may not be in the black but if I can get the CLF to breaking even, then I will be achieving several of my goals for this fine organization! 1) Proving that you do not need to take out bridging loans to run a business. 2) Able to do more for the CLF and be that much closer to being able to pay for patterns for future books. 3) Showing that you can be for profit AND socially responsible! What do I do with profits? Well, one day when I see any (grin) they will be invested directly back into the company. And maybe one day I can pay myself a little salary, that would be nice. I believe we can achieve great things in small ways, with good decisions, and firm core beliefs that run to the idea that if everyone does well we all do well! So, again thank you so much to everyone who has purchased the CLF First Ever Book, and also to those who have purchased our fabulous propoganda on our Zazzle Store! By no means am I rolling in dough here folks, but if I am correct we just might squeak through even and that is a cool thought. So a HUGE CLF SALUTE TO ALL OUR GREAT SUPPORTERS! CLF Member adr1enne made this gorgeous wrap using Motif 6 from Edie Eckman’s book Beyond the Square. This wrap wins our hookaclicious award! 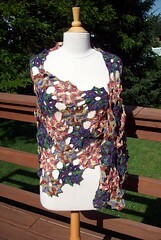 I love the motifs, I love the colors and I love the wrap. If you haven’t checked out Beyond the Square by Edie Eckman it’s a fabulous book of motif patterns, with suggestions in cartoon for for project ideas! I bought the book when it came out, but haven’t had much chance to use it, since my daughter took it for her own use and I am probably gonna just have to knuckle under and buy myself another copy! Once again I shall say, I LOVE THIS WRAP! 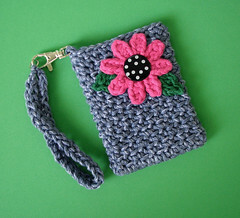 It should exactly what we can do with a simple idea, some hooks and some yarn! Congratulations adr1enne! Check out her project notes on Ravelry, for they too were excellent!